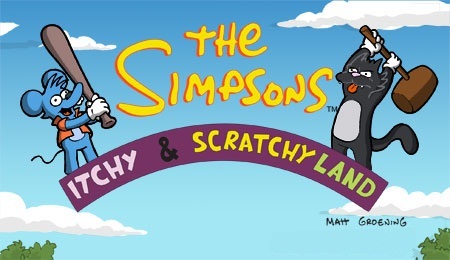 The Simpsons: Itchy & Scratchy Land is a 2.5D adventure mobile game based on The Simpsons released by EA Mobile in 2008. "Run For Your Lives! It's The Simpsons Itchy & Scratchy Land! Just like in the classic Simpsons episode, Our Favorite Family's theme park outing is ruined by Itchy & Scratchy 'bots. Play as Homer, Bart, Lisa and Marge as they survive Explosion Land, Unnecessary Surgery Land, Torture Land and Searing Gas Pain Land. Kill the Kill 'bots with Bart's stink bomb slingshot. Build Bomb 'bots with Lisa's Robo-Generator. Blow 'bots to bits with Marge's vacuum gun. Life is a thrill ride with The Simpsons." 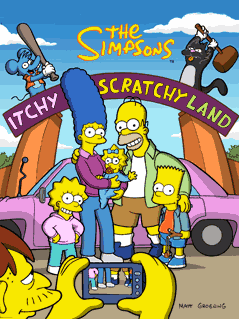 The game takes place in the episode "Itchy & Scratchy Land" and the mission is to save the theme park from the robots. 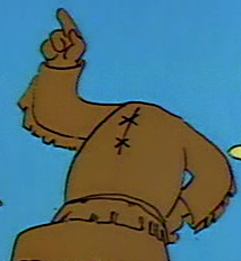 The main character is Homer. The last level is limited to two minutes. To finish some missions in every level the player must control Bart, Marge or Lisa Simpson. Depending on how well the player handles levels they can be rewarded with gold, silver, or bronze medals. The level points can be obtained by hitting combos, killing enemies and rescuing citizens. Every level has some checkpoints where the player transports to if Homer dies. When the player reaches a checkpoint they can see the current points and how many bonus points they have. To increase Homer's energy the player can sometimes collect upgrades. The player gets help on how to play the game from Comic Book Guy. "Explosion Land" is the first level. Here the player must get Homer through Explosion Land. In one mission Bart helps the player by destroying the robots with his stink bomb slingshot. Homer must also bowl through a tracks without crashing. "Unnecessary Surgery Land" is the second level. Here the player must get Homer through Unnecessary Surgery Land. In two missions Bart helps the player by destroying the robots with his stink bomb slingshot and helping Lisa control the bomb robots in one mission. Homer must also bowl through tracks without crashing. "Torture Land" is the third level. Modified on April 19, 2017, at 12:55.